That adorable Gerber Baby face is recognized all over the world, but the name behind the face is not widely known. In 1928, Gerber held a contest to find a face to represent a baby food advertising campaign. 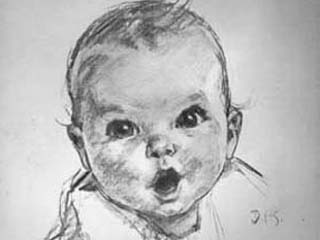 Artist Dorothy Hope Smith entered her simple charcoal sketch of a tousle-haired, bright-eyed cherub of a baby with endearing pursed lips. In her entry, Smith noted that she would finish the sketch if she won. Her drawing competed with elaborate oil paintings, but the judges fell in love with the baby face Smith drew, and when they chose it as the winner, they insisted that the simple illustration remain a sketch. The image of this happy, healthy baby was soon to become the face that launched a brand, a face recognized and loved across the globe. Indeed, the illustration became so popular that Gerber adopted it as its official trademark in 1931. Since then, the Gerber Baby has appeared on all Gerber packaging and in every Gerber advertisement. The identity of the baby, however, was kept secret for 40 years, until 1978. In a poll taken across the United States, people speculated as to the identity of the Gerber Baby. Guesses ranged from movie stars Humphrey Bogart and Elizabeth Taylor to Senator Bob Dole. Over the years there have been rumors of the actress Jane Seymour being the Gerber Baby. But mystery novelist and retired English teacher Ann Turner Cook knew the correct answer: She is the Gerber Baby. Dorothy Hope Smith, a neighbor of the Turner family, drew the portrait and after more than 85 years, Mrs. Cook’s sparkling eyes and adorable, curious baby face still personify the Gerber brand, representing Gerber’s commitment to happy, healthy babies all over the world.